In his speech on Trump administration's China policy at Hudson Institute on October 4, US Vice President Mike Pence accused Beijing of engaging in unfair trade practices. Pence claimed that much of China's GDP success "was driven by American investment in China" and quoted US President Donald Trump as saying "we rebuilt China over the last 25 years". He portrayed the US as the only Western major power that has never invaded but always helped China, and accused Beijing of ingratitude. But history can prove Pence's statements are wrong. The US is not as that noble as Pence described in its relations with China. The US had been one of the perpetrators of the indignities and exploitation that China suffered during the "Century of Humiliation" starting from the Opium Wars. It took part in trafficking opium to China, signed unequal treaties with China, invaded China as one of the Eight Nation Alliance and unilaterally imposed the Open Door policy. After the founding of the People's Republic of China, the US imposed a blockade against China and supported KMT remnants to counterattack Chinese mainland and initiated the Korean War and the Vietnam War, leading to deep isolation of China. Pence said that the US "brought China into the World Trade Organization". But it was the US that created consistent resistance during the 15 years of negotiations. Indeed, US aid enhanced China's ability of resisting Japanese aggression during the WWII and helped boost the country's education and culture. But behind the aid, there was US national interest and global strategic planning. It is undeniable that US investment did contribute to the Chinese economy, but according to the Chinese Ministry of Commerce, since 1987 when China started keeping statistics on foreign investment, the country has cumulatively used foreign capital of more than $2 trillion. Among them, US investment was $81.36 billion, accounting for only 4.06 percent. US exaggeration and obfuscation show that Washington is losing confidence in its China policy. China's rejuvenation relies on its resolve for self-improvement. During the 40 years of reform and opening-up, Chinese people have found a path to socialism with Chinese characteristics which best suits China's national conditions and leads to prosperity. With the help of innovative, coordinated, green, open, and shared development, China has tried to lessen the contradiction between unbalanced and inadequate development and the people's ever-growing need for a better life. China is marching toward being a great modern socialist country that is prosperous, strong, democratic, culturally advanced, harmonious, and beautiful. China's development relies on its open attitude. The country consistently follows the path of peaceful development and pursues an opening up strategy that brings in mutual benefit. China is committed to friendly cooperation with all the countries, including the US. Beijing has also transformed its independent economy into one that is guided by market and regulated by the government, which has lent momentum to China's steady economic growth. China's progress relies on the principle of reciprocity. 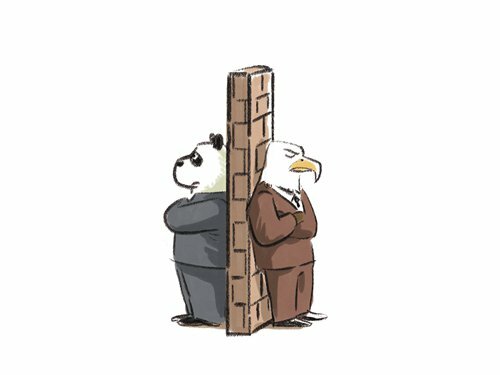 It means that the country will never seek its own development at the expense of other countries' interests, but Beijing will also firmly protect its sovereignty, interests and security. Reciprocity also means sharing the development dividend with people around the world. China's contribution to world economic growth has stayed at around 30 percent since 2013 and it has ranked as the largest contributor ever since. In 2017, China's contribution reached 34.6 percent, about twice of the US. China has established more than 80 overseas economic and trade cooperation zones with countries along the Belt and Road, adding 244,000 jobs. Pence's accusation of China being ungrateful is inconsistent with history. He neither faced the rationality and necessity of the Chinese path squarely, nor understood the meaning of independence and self-reliance. Pence's strategy is similar to then US secretary of state Dean Acheson's letter to US president Harry S. Truman in 1949, which aimed at confusing the public worldwide and seizing the moral high ground by denouncing China. As the midterm elections are approaching, the "China threat theory" has become an election strategy. Pence's speech was obviously unfair and meant to woo public support. As late Chinese leader Mao Zedong said in an article refuting Acheson's "Friendship" or Aggression? : "Seeking to justify aggression, Dean Acheson harps on 'friendship' and throws in lots of 'principles'".